Adin Steinsaltz is justly famous for his work on his Hebrew translation of the Talmud, for which he won the Israel prize. The Steinsaltz Talmud is cleverly presented with (clearly marked) interpolated text that helps explain the text (the Artscroll Talmud is similarly marked) and also integrates much of the commentary from the premiere annotators of Talmud: Rashi and Tosafos. There was an attempt by Random House (from 1989 to 2000) to translate the Steinsaltz Talmud into English, but only four tractates were translated (Bava Metzia, Ketubos, Taanis, Sanhedrin) and a wonderful introductory volume. I wanted to add a few words about the relationship between this edition and the volumes that were published by Random House a number of years ago. This is an entirely new project and translation and it has nothing to do with the Random House edition. 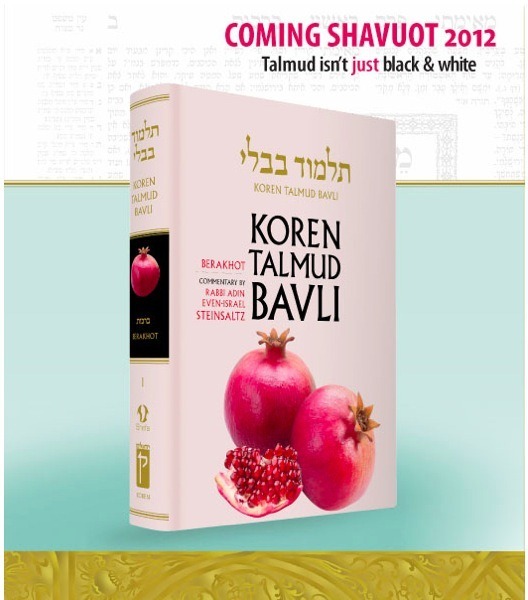 The entire Talmud will be published regularly and ahead of Daf Yomi. The whole project is projected to be completed within the next 4 years. Rabbi Steinsaltz has already started in on the interview circuit to talk about this new English translation of his Hebrew translation. Here is an interview he made for the PBS. Here is a New York Times report from 2010 on the completion of Steinsaltz’s Hebrew translation.